Thailand has shown considerable economic growth over the last 20 years, reducing the poverty rate from 21 percent in 2000 to 13.2 percent in 2011, according to the World Bank. Although the country has made strides in reducing poverty, improving nutrition and meeting basic needs of its residents, inequality is still pervasive. Salesian programs in Thailand focus on education and workforce development in partnership with social development services that work to meet the basic needs of youth and their families living in poverty. One of the most marginalized groups in the Thailand is people with disabilities. Often those with disabilities, particularly those with visual impairments, are kept out of school and denied an education. As a result, their future employment prospects are diminished and the cycle of poverty continues. Through a commitment to defend the rights of those with disabilities and the development of specialized training, Salesian Father Carlo Verlado and his team help visually impaired youth gain independence and transition from social isolation to leading lives of inclusion and productivity. Each year, 40 students with visual impairments embark on an intensive two-year educational program at the Nonthaburi Skills Development Center for the Blind in Bangkok, run for more than 35 years by Fr. Verlado. When the program first started students were taught trade skills in carpentry and woodworking. Some students were able to find work but many others were denied employment because local employers feared workplace injuries and were put off by the higher costs of insuring visually impaired employees. As a result, the program began training its students to be massage therapists. As an acknowledgement of the high-quality training offered and the program’s years of success, the Ministry of Public Health has begun to license graduates as doctors of Thai traditional massage. Most graduates are able to find work immediately and continue to hone their skills for many years. Other programs at the school offer a comprehensive curriculum that goes beyond teaching a trade. In addition to gaining an education and learning valuable job skills, students participate in activities such as judo, baseball, bicycle riding and competitive running, all of which foster physical development and self-confidence. One of the most marginalized groups in Thailand is people with disabilities. Often those with disabilities, particularly those with visual impairments, are kept out of school and denied an education. As a result, their future employment prospects are diminished and the cycle of poverty continues. Each year, 40 students with visual impairments embark on an intensive two-year educational program at the Nonthaburi Skills Development Center for the Blind in Bangkok, run for more than 35 years by Fr. Verlado. When the program first started, students were taught trade skills in carpentry and woodworking. Some students were able to find work but many others were denied employment because local employers feared workplace injuries and were put off by the higher costs of insuring visually impaired employees. Five graduates from the Salesian Nonthaburi Skills Development Center for the Blind in Thailand’s capital of Bangkok have formed a Thai men’s goalball team and participated in the third edition of the Paralympic Games of Asia held in Indonesia in October 2018. Goalball is a team game that can be played by athletes with visual impairments. The team spent weeks from August until early October training at the gym at the local Salesian center. The Nonthaburi Skills Development Center for the Blind was first established in 1978 by Italian missionary Father Carlo Velardo. In 2009, the center was awarded the prestigious Van Thuân Solidarity and Development Award for its work. In September 2016, an unusually active monsoon season drenched the central and northern parts of the country, unleashing raging waters across more than 20 provinces and killing an estimated 350 men, women and children. According to the United Nations, more than 2.5 million people were affected by the relentless storms. The flash flooding also knocked out electric lines and damaged hundreds of schools. 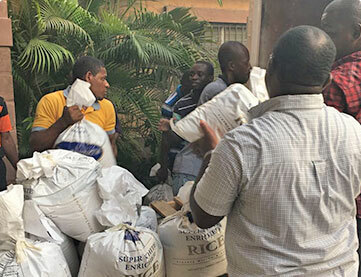 The Salesian joint relief team traveled to visit affected areas and distributed hundreds of food and emergency kits for the suffering families in the area. The team focused most of its relief efforts in Bang Saphan and Nakhon Si Thammarat provinces.